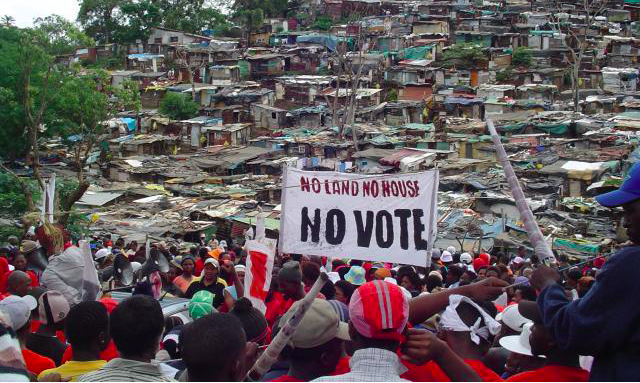 In the past six months the notorious Anti Land Invasion Unit, with the support of the eThekwini Metro Police, has been regularly demolishing and burning down people’s homes in the eKhenana land occupation. On Thursday 20 December more than 46 homes were demolished and three were burnt down by the Anti Land Invasion Unit. There was no court order and this was, therefore, another illegal attack on the occupation. This occupation has not come easy as many people have been injured after being shot with live ammunition by the Anti Land Invasion Unit. On Sunday at around 8 pm one of the participants in the occupation, and a leader in the protests organised to defend the occupation, Senzo Gumede, was shot and killed by unknown men in a nearby area. Senzo was vocal against those who opposed the occupation. He took a leading role in organising the road blockades used to defend the occupation when it was under attack. He had been threatened by the ward councillor in the area, and, on a number of occasions, he was also threatened by taxi owners who said that the road blockades were hampering their business. As we go to court on Thursday 27 December we want to ensure that the rights of the impoverished and marginalised cannot be grossly violated with impunity. While the ANC continues to render people homeless during the festive season our movement will continue to defend the dignity of the poor at this time. We will continue to occupy and keep land for living and thriving. We expropriate land for the poor from below unlike the hypocrites in Parliament who talk about land reform while violently and illegally repressing the struggles of the people. We continue to redress the injustices of the past via organisation and struggle from below. We want to do away with apartheid spatial planning via grassroots urban planning and direct action. It is time that ordinary poor black South Africans realise that the ANC led government has failed to ensure that land is returned to the people. It is time to organise democratic power from below and to occupy land for living.